Surveys suggest his popularity is waning just three months after he took office. A majority of Indonesians disapprove of President Joko “Jokowi” Widodo just three months after he took office, according to a fresh survey. According to a public opinion survey conducted by the Indonesian Survey Circle (LSI) from January 26 to January 27, the approval rating for Jokowi stood at 42.29 percent. That is a significant drop from Jokowi’s approval rating of 71.73 percent last August. The survey was carried out across 33 provinces and involved 1,200 respondents. It was conducted during a period when Jokowi came under fire for dithering amid a conflict between the country’s anti-graft agency and its notoriously corrupt police force after the agency had declared Jokowi’s nominee for police chief to be a corruption suspect on January 13. The nominee was a close aide to the chairwoman of Jokowi’s party and former president Megawati Sukarnoputri. 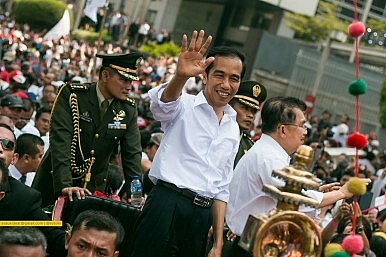 The incident took some of the shine off of his reputation as a clean politician and bold reformer which led him to become the country’s first president from outside the Jakarta elite following elections last July. “The majority of the respondents…said they were dissatisfied with Jokowi’s performance. They also regret the fact that Jokowi lost his momentum only after 100 days in office,” LSI researcher Adjie Alfaraby said in a press conference on Thursday according to The Jakarta Post. Last week, another survey by the Social and Political Study Center (Puspol) Indonesia showed that nearly 75 percent of respondents disapproved of Jokowi’s presidency. That survey was carried out between January 6 and January 16 and involved 756 respondents. The disapproval was read to be due more to his overall performance since it did not fully capture the impact of the incident mentioned above. In addition to general perceptions about Jokowi’s performance, that survey also asked respondents about specific areas such as education, maritime policy, and fuel subsidies in order to dig deeper into their views. Nearly half of respondents said the fuel subsidy cut was an incorrect decision, and a majority of them did not believe that the government money from the subsidy cut would be utilized to advance development. Jokowi had slashed subsidies last November to ease the pressure on government finances and fund his domestic initiatives in areas such as healthcare and infrastructure. The most positive response came in the area of maritime policy. An overwhelming majority of nearly 75 percent of respondents said they approved of Jokowi’s approach, which has involved a controversial ‘sink the vessels policy’ to eradicate illegal fishing as The Diplomat has reported extensively (see here, here, and here). Interestingly, the survey also asked respondents to score Jokowi’s communication skills on a scale of one to 10, and Jokowi scored a low 5.76 despite his reputation as a down-to-earth politician who actively tries to connect with his supporters at the grassroots level. “While the public admire his blusukan [impromptu visits], they perceive his communication skills to be lacking. It’s a far cry from former president Susilo Bambang Yudhoyono, who many saw as being an intelligent communicator. Therefore, I believe he needs a spokesman,” Puspol Indonesia director Ubedilah Badrun said according to The Jakarta Post. Jokowi was inaugurated on October 20 last year and is expected to govern the country until 2019.